Show Racism the Red Card Wales visits Caerleon Campus' trainee teachers. Show Racism the Red Card was supported by the National Union of Teachers (NUT) Cymru to deliver a one-day conference for University of South Wales students. In between the anti-racism workshops principal officer at NUT Cymru, Stuart Williams, gave students one to one drop in advice on looking for and applying for jobs. Through a number of activities, SRtRC talked to the students about definitions, terminology and challenged them to think about perceptions and stereotypes. Sessions informed the trainee teachers about the materials available to help tackle racism in schools and best practice when reporting and dealing with racial discrimination. The students were introduced to resources and lesson plans by Education Worker Noam Devey with particular attention paid to immigration. He highlighted the differences between asylum seekers, refugees and economic migrants. He provided ideas for games and activities that would encourage children to critically think about their own stereotypes and encourage non-judgmental classrooms. The students responded positively to the workshops and took away valuable lessons from the group activities and discussions in which they were encouraged to view racism through the lenses of the children they will be teaching. In addition students were provided with hands on support and advice on how to proactively mitigate racism in their classroom and how to reactively respond and follow up when an incident occurs. All of the trainee teachers fed back that they had learned something new and valuable for their future practice. 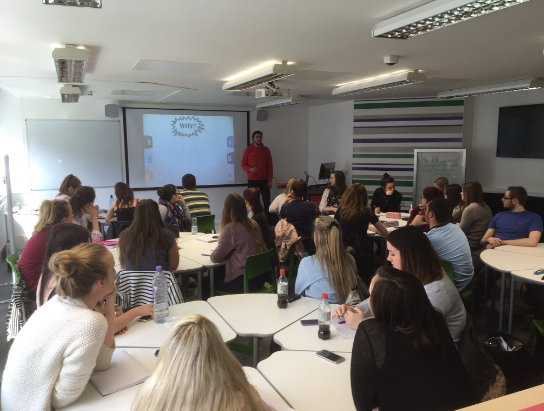 We will be delivering further conferences at Bangor University in June.